Godfatherism is a feature of Nigerian politics and anyone entering politics usually look for one. In states where they hold sway, the godfather decides who picks the party’s ticket for all important elective offices. They also decide who gets appointments in the cabinet of their state and how resources are allocated. This is how they an empire of loyalists who do their bidding. They wield so much power and influence in their states that the people have come to believe that they’re the undisputed political leaders of their states. But the recently conducted presidential, gubernatorial and national assembly elections have proved that some of them had lost touch with their people. They and their candidates were soundly rejected in some states. It is a lesson for godfathers who put their interests above that of their people. Godswill Akpabio is a former Senate Minority Leader and former governor of Akwa Ibom State from 2007 to 2015. During Mr Akpabio’s tenure as governor, he was able to build a strong political structure for himself in the state. He, however, could not save himself in the 2019 race. Mr Akpabio, who left PDP for APC last year, lost his bid to return to the Senate in Akwa Ibom North West Senatorial District. His new party, APC, also lost all the elections in Akwa Ibom. Before the elections, Mr Akpabio was so confident that he could not lose elections in the state. After all, he helped install the incumbent governor, then a political neophyte in 2015. The following month, he decamped to APC after meeting with President Muhammadu Buhari earlier in London. Mr Akpabio came into the political limelight in 2002 when he was appointed Commissioner for Petroleum and Natural Resources in the state, and later that of Chieftaincy and Local Government Affairs. He used his Office as Commissioner for Chieftaincy and Local Government Affairs to build political structures across the 31 Local Government Areas in Akwa Ibom State. He defied the then governor, Obong Attah, to emerge the governorship candidate of the PDP in 2007 and was elected governor. Since then, he’s had a firm grip on the politics of Akwa Ibom. He was, however, humbled in his own game as his new party, APC, lost all the elections in Akwa Ibom. He was elected Deputy Governor of Sokoto State to Governor Attahiru Bafarawa in 1999, on the platform of the All Nigeria Peoples Party(ANPP). He was re-elected Deputy Governor for a second term in April 2003. He resigned as Deputy Governor of Sokoto State on 15 March 2006. Aliyu Wamakko was elected governor of Sokoto State in April 2007, representing the Peoples Democratic Party (PDP). He handed over power to Aminu Tambuwal in 2015 after serving two terms as governor. Wamakko is believed to be a consummate grassroot politician who had the people in his pocket. When Tambuwal left the APC which brought him to power, pundits believe the end of his tenancy in the Sokoto Government House had come since he would be running against Wamako’s candidate. However, despite retaining his seat as senator in Sokoto North senatorial district in the senate, his anointed and preferred candidate, Ahmad Aliyu of APC however lost the guber seat to incumbent governor, Aminu Tambuwal of the Peoples Democratic Party. George Akume is another ‘godfather’ whom things did not work in his favour during the last election. Since his election as Benue governor in 1999 on the PDP platform, Mr Akume has held a firm grip on the politics of Benue. After he completed his tenure in 2007, he moved to the Senate. He won his Senate seat again in 2011 despite defecting to the Action Congress of Nigeria (ACN) and was elected the Minority Leader of the Senate. Mr Akume was again re-elected senator for Benue North-west in the 2015 elections on the platform of the APC, a party formed by the merger of different parties including the ACN. Mr Akume also largely contributed to the victory of Samuel Ortom in the governorship election in Benue. Both men, however, went separate ways in the aftermath of the repeated herdsmen crisis in the state. Mr Ortom moved to the PDP while Mr Akume remained in the APC. For the first time since 1999, however, Mr Akume lost an election in Benue despite being a staunch member of Nigeria’s ruling party. The APC also lost the presidential and governorship election in Benue. The Saraki dynasty is a very strong one in Kwara State. Before Mr Saraki, his father, the late Olusola Saraki’s political structure was such a strong force that except you align with him, you were not likely to succeed as a politician in Kwara State. 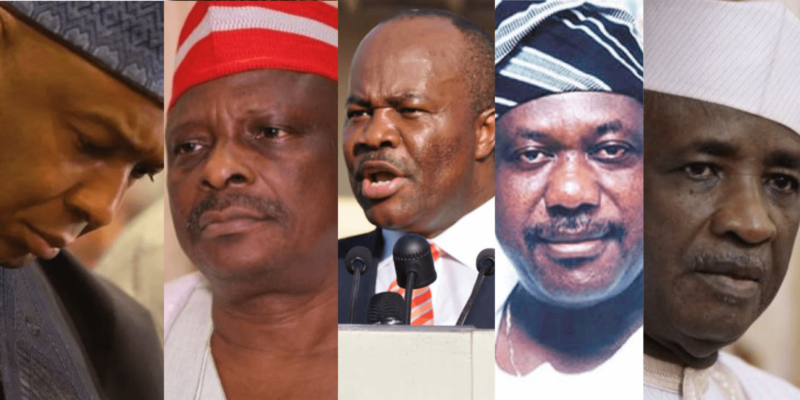 The structure had produced six governors in the state since 1979. Mr Saraki who has been the President of Nigeria’s Senate since 2015 could not deliver Kwara for his party in both 2019 presidential and governorship elections. Worst of it all, he also lost his re-election bid to the Senate. He was elected governor of Kwara in 2003 through the help of his father. After his tenure, he refused to support the candidature of his sister, Gbemisola. Instead, he supported the incumbent governor, Ahmed Abdulfatai, who floored his sister against the will of his father. In the build-up to the 2015 election, Mr Saraki joined other aggrieved governors of the Peoples Democratic Party (PDP) to form the nPDP. The nPDP would later join other parties to form the All Progressives Congress (APC). That did not affect his control of the Kwara’s political machinery as Mr Saraki’s new party, APC, won the 2015 general elections in Kwara. Mr Saraki’s troubles, however, started after the 2015 elections when he defied the APC, to emerge the Senate president; working in cahoot with PDP lawmakers. He, eventually, left the APC for the PDP in 2018 and sought the presidential ticket of the latter. He lost the primary to Atiku Abubakar. Things, however, got worse for Mr Saraki as he lost his senatorial seat. His anointed candidate for governorship was also defeated in all the 16 local government areas in the state with the magic of “Oto ge”. Overall, the PDP lost woefully in all the 2019 elections in Kwara. Except the PDP presidential candidate succeeds in his challenge of President Muhammadu Buhari’s electoral victory, Mr Saraki may have to be a ‘spectator’ in Nigerian politics in the next four years; the first since he became a politician. Senator Rabiu Musa Kwankwaso is one political godfather that has a large following in not just Kano state but also in some few states in North West Nigeria. He bestrode the Kano political landscape like a colossus. He is so powerful that politicians in the state seek his ‘blessing’ before embarking on any political adventure. He was former governor of Kano state between 1999–2003 and 2011–2015. Kwankwaso was the first governor of Kano State in the fourth republic who was elected under the platform of People’s Democratic Party (PDP). He lost re-election bid in 2003 to Ibrahim Shekarau and was in July same year appointed defense minister by President Olusegun Obasanjo. In 2015, Kwankwaso unsuccessfully contested the presidential primaries nomination under the opposition All Progressive Congress, but lost to Muhammad Buhari. He then swapped to contest the senatorial seat for Kano Central Senatorial District. He again contested for the presidential ticket of the Peoples Democratic Party, PDP late last year but lost to Atiku Abubakar. He was rumoured to be a favorite of the North and most part of the country and would have won the February 23 presidential election if he had gotten the PDP’s ticket. That tells of how powerful and influential he is. The result of the March 9 governorship election in Kano also affirmed the godfather position of Kwankwaso before the election was declared inconclusive by INEC. His anointed candidate for the guber polls, Abba Yusuf of the Peoples Democratic Party (PDP) was in the lead. Incumbent Governor Abdullahi Ganduje of the All Progressives Congress, APC was about 27,000 votes behind when elections in more than 200 polling stations in the state were cancelled. But after a re-run in the affected areas on Saturday March 23, the APC candidate won some 36,000 more votes than Mr. Yusuf, thereby Kwankwaso losing his grip on the soul of the North West state.